Modern ranks 43rd in this year’s top 100 pest control companies! Modern Pest Services ranked an impressive 43rd in this year’s top 100 pest control companies in North America. The PCT list is based on revenue from 2012. Every year Pest Control Technology, a pest control news and resource center compiles the top 100 list after reviewing the revenues of 20,000 pest control companies in North America. This year, there are 30 states represented as well as three Canadian provinces, with California and Florida having the highest number of firms. In 2002, when PCT came out with its first top 100 list, Modern was ranked 80th, but the company has continuously ranked higher each year. In 2010 we were ranked 53rd, in 2011 we were ranked 45th and last year we were ranked 44th. This means that we are steadily climbing the list and our dedication to business growth and development has allowed for our continued success. Collectively, the companies in the PCT Top 100 list earned revenues exceeding $5.5 billion in 2012. For more information on the Top 100 list, please click here. A leader in the pest control industry since 1945, Modern Pest Services is a third-generation family-owned and operated pest management company. Offering residential and commercial pest control solutions to clients throughout New England, our fully trained pest management professionals provide quick and effective pest control solutions utilizing the least toxic and lowest-risk products available as part of an integrated pest management program. Modern is one of only 21 pest control companies in the United States to be named by the EPA as a Pesticide Environmental Steward and has been recognized by the National Pest Management Association (NPMA) for meeting the established standards of a QualityPro company. We are also alliance partners of Copesan as well as several national, regional and local associations. Our offices are headquartered in Brunswick, Maine and we offer service centers in Portland, Bangor and Augusta. In Massachusetts, we have a service center in Woburn and in New Hampshire, we have a service center in Manchester. Throughout New England, Modern services over 15,000 clients. 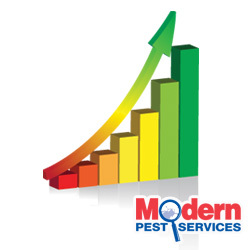 For more information, contact Modern Pest Services.